It can be really difficult to get out to take photographs in the wintertime. The days are short, the nights are long and there’s not much light. Here in North Yorkshire, where I live, the moors are wild and windy and bloody freezing in winter. Stripping down to a nightgown in subzero temperatures or wading into a freezing river just seems like utter madness, not to mention a little bit dangerous. I have been out when the wind was so strong that my tripod wouldn’t stay standing, when the rain was blowing sideways, when my hands were so cold I couldn’t operate the controls of my camera, and when my feet were like blocks of ice. Unlike those crazy people who jump into the freezing cold seas on Christmas Day, I did not enjoy this experience. It didn’t make me feel alive. It just made me feel ill. These days, I rarely go out to photograph in winter, unless there is snow. But that doesn’t mean I spend the winter doing nothing. Instead, I use this time of year to refill my creative well and develop new ideas for my images. 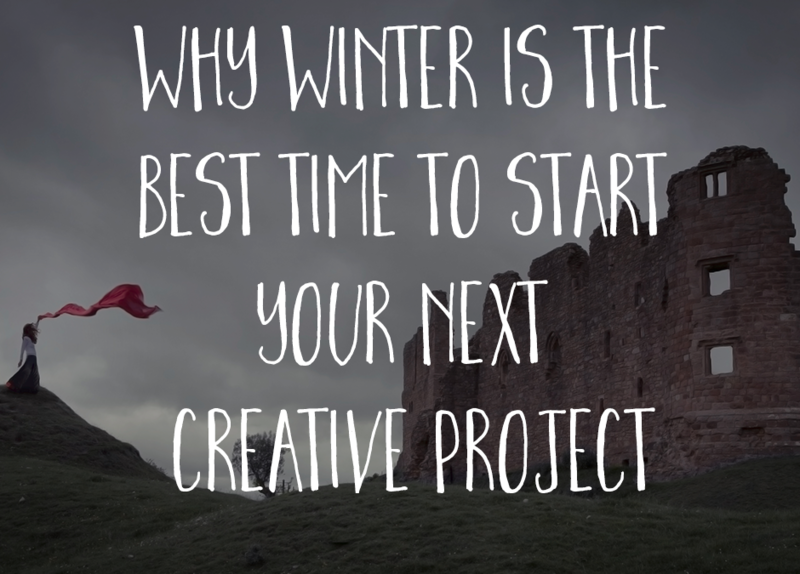 This practice of taking the winter to sow seeds of ideas that can come to fruition in the springtime has served me very well, whether those are ideas for my creative work, or even ideas for my business. Here’s why it works so well. We think of creativity as spontaneous, a flash of brilliance that appears out of nowhere, but in reality that flash only happens when there is preparation. The process of creating begins deep inside and it begins in quiet, introspective moments. These moments allow us to recognise what is going on inside us and to see what is trying to communicate with us. Winter, as it turns out is a fantastic time for introspection. The winter solstice is a perfect metaphor for rebirth and new beginnings, a moment of stillness, before the world starts moving again. It’s a great symbol of quiet contemplation and I always do my best thinking at this time of the year. The best creative projects begin months, sometimes years, before they are executed. Good ideas take time to come together. They are very often the result of digging into the things that pique your curiosity and then looking for the connections between them. It takes time and it requires you to become a collector of your thoughts and idea fragments, long before they become something useful. In Elizabeth Gilbert’s fantastic TED talk on creativity and ideas (one of my all time favourites) she talks about the poet Ruth Stone and how she saw the process of inspiration. And it’s so much the same for us. We need to be standing in front of our ideas, pen and paper in hand, when they come at us over the landscape. We need to have done the preparation and be ready to capture them, or they simply pass through us and disappear. When you see the moment, it has already passed. Just as we need to be ready for that moment when our ideas come barreling across the landscape, we also need to be ready when the seasons turn and the landscape looks just right for our images. Every landscape photographer knows that one of the great cruelties of photography is that, when you see the perfect moment to photograph, you’re already too late. Think about how many times you have noticed a sunset and pulled over in your car, or run upstairs to get your camera to take a photograph. By the time you get your camera ready, it doesn’t look quite the same does it? That moment that takes your breath away only lasts a second and then it’s gone. The only way to capture it is to be standing in front of it before it happens. It’s the same with the blooming of the flowers. By the time I notice the bluebells, or the snowdrops, or the heather, I have a very limited window of time to get my photograph. Maybe just a couple of days. If I have no ideas already in place for an image I want to create, I know I’m not going to produce my best work. There are always happy accidents, but most of the images I’m most proud of have come from a kind of soup of ideas that I develop through regular creativity exercises and vision boarding. It’s much easier to be creative on the spot when you have a pool of ideas to choose from. So, spend some of those long winter evenings writing in your journal, or rereading your favourite books, or discovering a new passion. Follow your curiosity. Follow your interests. Get into the habit of gathering together your ideas and your inspirations and get ready to be standing in front of those ideas once Spring arrives. I really enjoyed this blog post and your lovely photography. Thanks Charity! That’s very lovely of you.